Looking for the Euchner website? Click here. 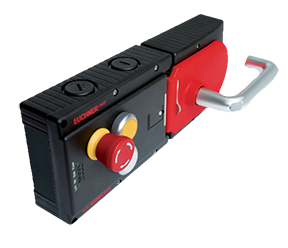 EUCHNER safety switches monitor safety doors on machines and installations, help to minimize dangers and risks and thereby reliably protect people and processes. Today, our products range from electromechanical and electronic components to intelligent integrated safety solutions. Safety for people, machines and products is one of our dominant themes. EUCHNER’s MGB (Multifunctional Gate Box) is a unique interlocking or guard locking system for the protection of safety doors on machines and systems. It is more than a safety switch, more than a bolt, and offers a lot more functionality. The safety switch has two safety outputs. 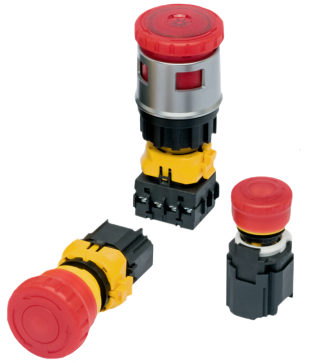 These outputs are connected directly to drives, downstream safety relays or safe control systems. The switch monitors itself for short circuits and other faults using pulsed signals. External pulsed signals are not required. External pulsed signals from non-Euchner devices are not allowed. 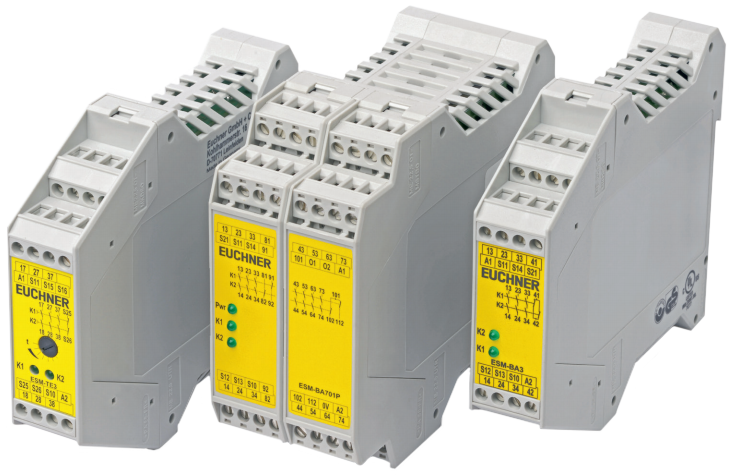 Euchner safety relays come in a compact housing with up to 7 Safety Contacts + 4 Aux contacts. Standard or time-delay expander modules are available as well as 2-hand control modules. Mosaic is capable of monitoring several safety sensors and commands, such as safety light curtains, non-contact switches, photocells, mechanical switches, mats, emergency stops, two-hand controls. 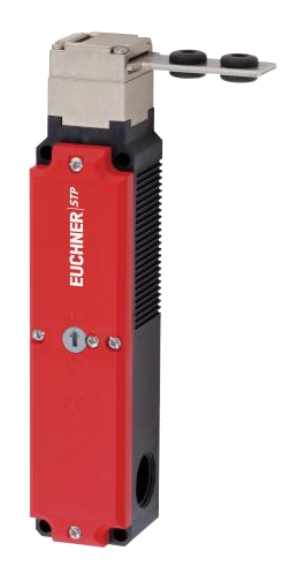 EUCHNER Emergency Stop Devices come with innovative technical features. The Emergency Stop Device has contact block monitoring to check whether the switching elements fitted are actually all correctly seated in the switch. If the switching elements should come loose unintentionally, an e-stop command is triggered automatically by the detaching switching elements. Enabling switches are manually operated control devices that, together with other control switches, enable commands related to potentially hazardous conditions to be run, as long as the enabling switches are actuated continuously. 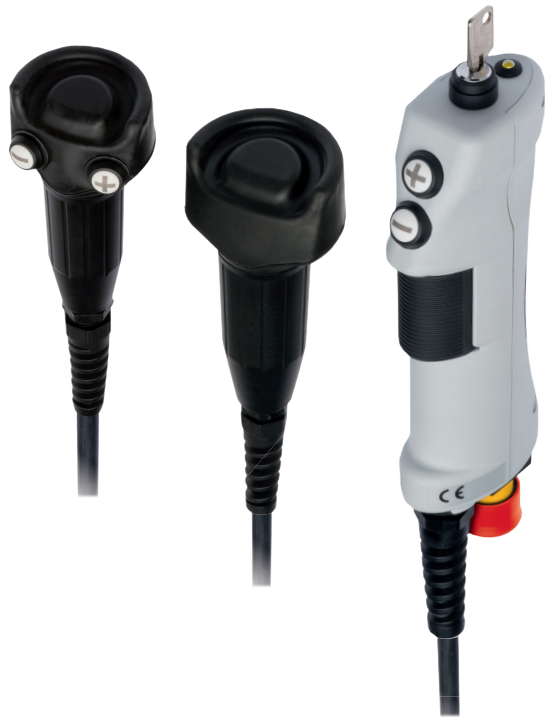 Euchner provides handheld enabling switches as well as enabling buttons.